With solar technology being better and more cost effective than ever, the next big area of need is in soft cost reduction. That’s why this new web-based SolarDesignTool is so exciting — it is a complete permit package generation tool for residential rooftop photovoltaic systems. Each solar permit package contains a cover page, site plan, single-line diagram, placards and labels, attachment plan, fire safety plan, equipment data sheets and certifications, and attachment detail when using rail-based mounting components from Unirac, SnapNRack, IronRidge, or Quick Mount PV. “The permitting process has typically been a major headache for installers and the last major hurdle to getting solar into the hands of the consumer,” says Derek Mitchell, SolarDesignTool’s founder and CEO. Conceived as an alternative to traditional CAD-based methods of permit package creation, prone to long turnaround times, human-induced typos, and miscommunication errors, SolarDesignTool’s web-based approach allows solar installers to specify a system design in as little as 15 minutes, then generate and download a complete permit package instantly with a single click. In addition to improved speed and accuracy, automation and economies of scale allow for radical reductions in price. 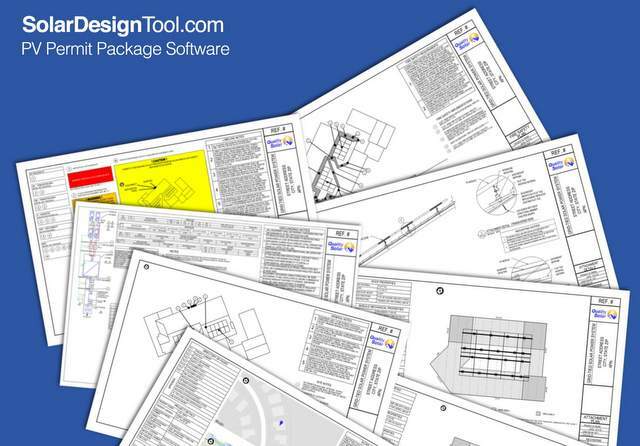 SolarDesignTool’s permit packages are priced at just $49-85, depending on volume. Each permit package comes with unlimited free revisions and a money-back guarantee if rejected by the AHJ.